For the last month or so, about every other post on the Pennsylvania Bird listserve has had the topic line, “ww crossbill”. 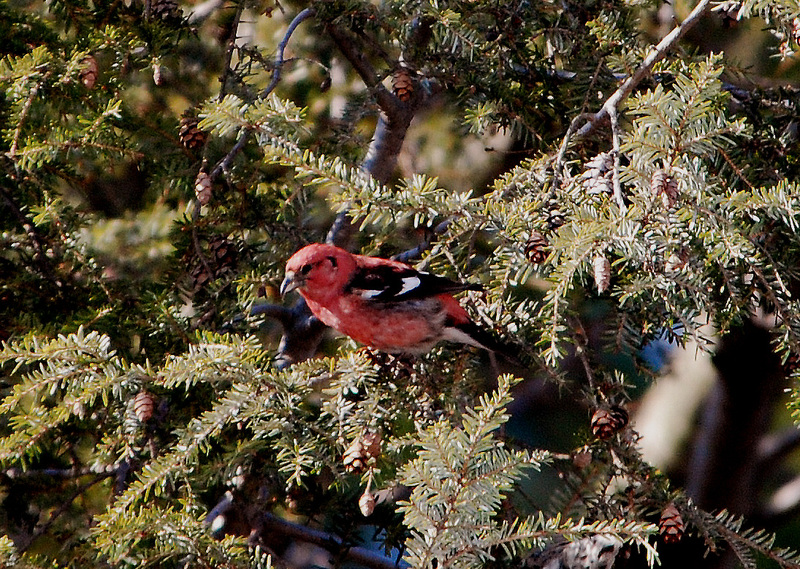 Each backyard, cemetery, or park with a spruce or hemlock tree was reported to have White-winged Crossbills. I was getting a little sick of it to tell you the truth. When were we going to see them here in Delaware?? They have arrived at last. Last week someone reported a flock on a private property in New Castle County. Derek Stoner heard some flying over the Delaware Nature Society’s Flint Woods Preserve in Centreville a few days ago, but never saw them. This morning, I set out to find some, and succeeded big-time. At a private property near Ashland Nature Center, I discovered a flock of about 50 White-winged Crossbills feeding in hemlock trees. What a sight they were! 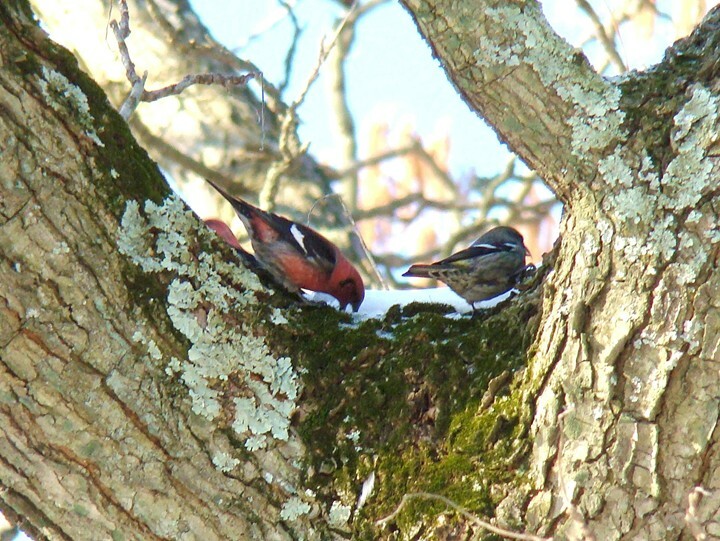 The male is pinkish-red, and female is yellowish-green, and both are absolutely beautiful. The bill is crossed at the tip, which is an adaptation for extracting seeds from hemlock, spruce, and tamarack cones. This is rather difficult to see in the field, especially when they are at the top of a 50-foot tree and blowing around in the wind. After I found the birds, I quickly got Jim and Amy White, who live nearby, over to see them. We watched the large flock fly around, land, and quickly get up again, since there were two Sharp-shinned Hawks nearby, spooking them. The birds called as they flew, making a sound that is described as someone typing on an old-fashioned typewriter. At one point, the birds flew into a deciduous tree and began eating the frozen, crusty snow that was on the larger branches. After an hour, the show was over and the birds departed for some unknown roost or feeding area for the remainder of the morning. Why are they here?? This species normally lives and breeds well to our north in the boreal forests of Canada. They are a very nomadic species, however, moving from place to place to find good crops of hemlock, spruce, and tamarack tree seeds. This year, apparently the cone crop was not good to our north and the birds have come south in huge numbers. Since their favorite food sources do not grow here naturally, the White-winged Crossbill should be looked for in areas that have large planted hemlock and spruce with cones. If you would like to see these birds, we are meeting at Ashland Nature Center on Monday, February 2 at 8:45 a.m. to go find them. We hope to see you there. First of all, the correct answer to the trivia question from the Green Living Series post is…the Microwave. Microwaves tend to use a lot of energy when operating, but when cooking times are reduced, such as making a cup of tea, they use about two-thirds the energy of a conventional or gas oven. 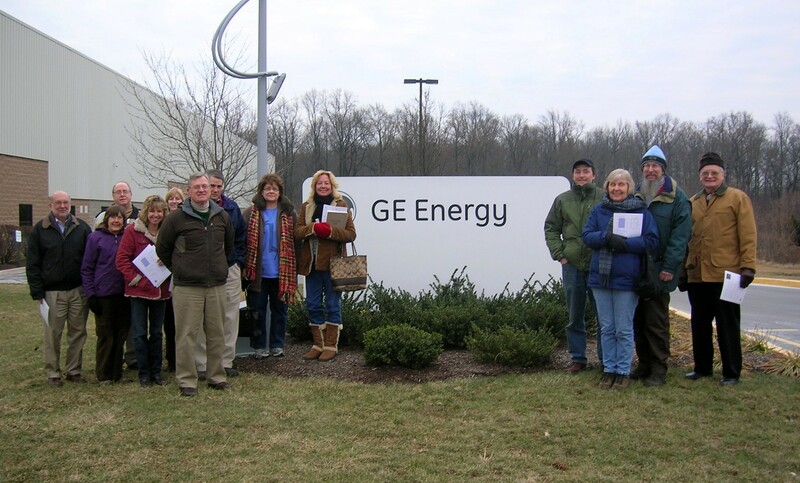 To kick off the Delaware Nature Society’s Green Living Series, I took 12 members to the GE Solar Manufacturing plant in Newark, DE. It is one of only two GE solar panel manufacturing plants in the world. The other is in China. It is here because GE bought AstroPower, an independent solar energy company that was started with University of Delaware research technology. The GE presenters ranged from Operations and Quality, to Sales and Product Line staff. They all were extremely knowledgeable and able to convey technical aspects in a clear, easy to understand manner. In fact, our attendees had so many questions that we stayed 1/2-hour longer than expected. I eventually dragged them away so I could get home for dinner! GE has been involved in solar energy production for about 40 years, but interest in the US has just recently increased. Most of the demand up until 8 years ago has been in Africa and certain third world countries where electricity is not often available and solar energy is the only option to pump water for villages and towns. I also learned that residents do not actually use the solar power they produce. It goes back into the grid and provides credit to their electric bill (your electric dial actually runs backwards!). Bill Haldeman, a participant on the program, was looking to get some answers for his employer, who is considering adding solar panels to the property. He said that they really dispelled some misconceptions for him. “Shading one little spot on the panel disables it because the cells are all connected,” Bill said. Bill also learned that the panel needs to be attached to your existing electrical system, since the power you generate goes directly back to the grid, not to directly power your home or stored in a battery. Bill also said that, “During a power failure, you won’t be using the solar power your produced. Your house will still be dark, since the solar panels simply feed the grid and don’t directly contribute power to the house”. Bill also learned that you shouldn’t purchase one that is too big, because if you produce more energy than you use, you won’t get paid for the extra energy you feed into the system and won’t realize the return on your investment for the bigger solar array. Join us for the next Green Living Series program will be on February 9th from 6-8pm, entitled “Green Cleaning and Home Energy Audit Workshop”. Register on-line at www.delawarenaturesociety.org. 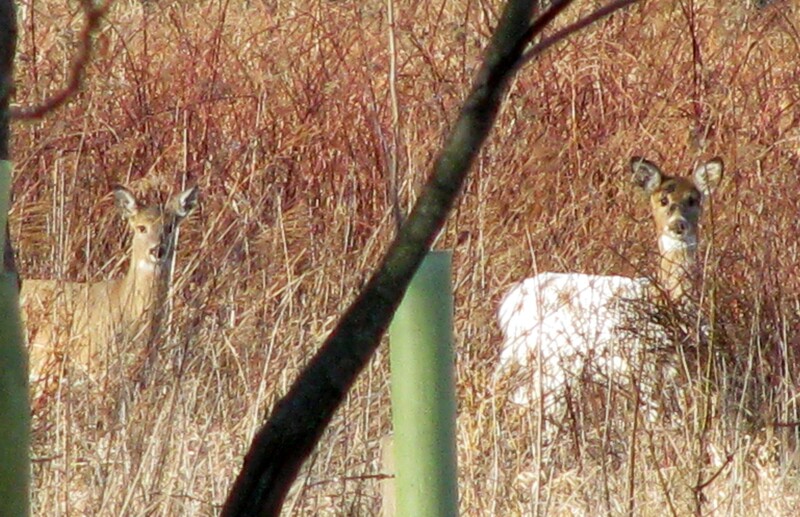 A piebald deer at Ashland, next to a normal-colored counterpart. When we think of winter, we often think of white: snow, ice, and clouds. But an unusual white creature is roaming the grounds of the Ashland Nature Center this winter– a partially white deer! Known as a piebald, partially-white deer are the result of a genetic abnormality cause by a recessive gene. Less than 1% of the white-tailed deer in a population may exhibit this condition. Studies have shown that some piebalds may have other genetic abnormalities that may affect their health, and certainly the white coloration makes them more noticeable to predators. Some piebald deer may have very limited amounts of white, while others may be almost completely white. Piebalds all have brown eyes, black noses, and dark hooves, a distinction from a true albino deer that would have red eyes, a pink nose, and pink hooves. The deer at Ashland appears to be a doe fawn, probably born this past June and weighing about 60 pounds by now. This deer is white from the tail up to the front shoulders, but has a brown neck and head. She is usually seen in the afternoons, browsing in the floodplain meadow across from the nature center in the company of 8-10 other deer. From a distance, she looks like a ghost drifting through the meadow! The Delaware Nature Society’s Abbott’s Mill Nature Center is located near Milford, DE. The site contains natural areas, a trail system, pond, stream, and nature center in addition to the Mill itself. 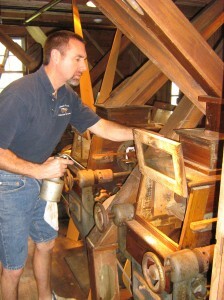 Stop in for a visit your family will enjoy, and make sure to join us on one of our “Running of the Mill” days. (see below for details). 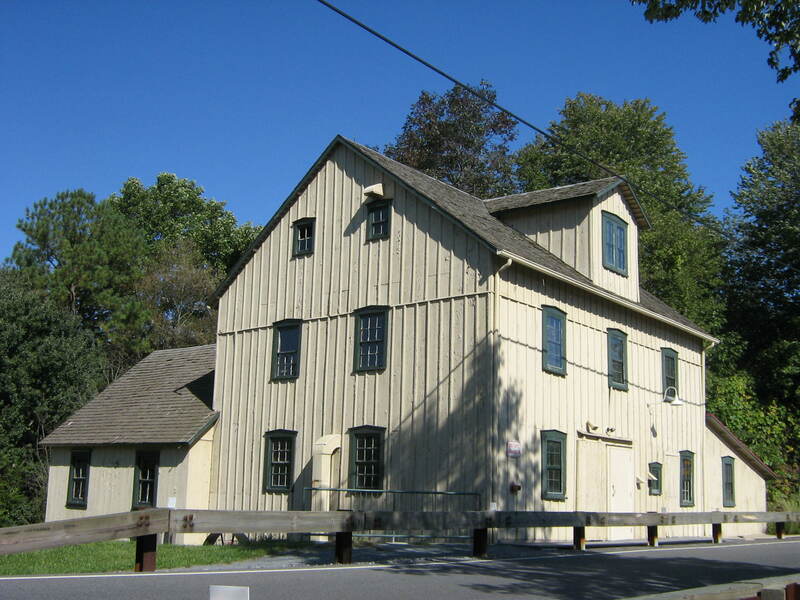 Abbott’s Mill’s rich history dates back to 1795, when Nathaniel Wiley dammed Johnson’s Branch and built a saw mill. Names, owners, and equipment changed over the past two centuries as it transitioned to grist stones and roller mills. Ainsworth Abbott, the last miller who retired in 1963, sold the mill to the state of Delaware exactly as it functioned until his retirement. 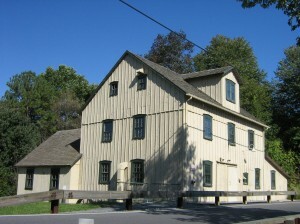 Abbott’s Mill is now managed by Delaware Nature Society for the State of Delaware Division of Historical and Cultural Affairs. 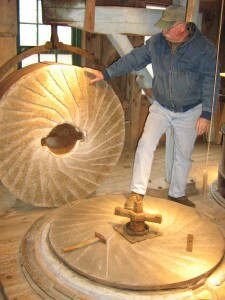 The mill’s water turbine, grist stones, and roller mills are all operational following an extensive preservation project that started in 2004. Elliott Workman, Land and Facilities Coordinator for Abbott’s Mill Nature Center, will be offering guided tours of this regional treasure on “Running of the Mill” days throughout the year. Experience the rush of water through the turbine and the rumble of the stones as you step back into Delaware’s milling tradition.